Oppo R19 Likely to Feature 48MP Camera, Pop-up Selfie Camera - Playfuldroid! In the past week, the rumor mill had revealed that Oppo will be soon introducing the Oppo F11 Pro smartphone in India. The leak had revealed that it would be equipped with a pop-up selfie camera of 32-megapixel and a rear-shooter of 48-megapixel. A fresh leak that shows a leaked poster of the Oppo R19 has surfaced recently. The poster shows the R19 sporting a design that is very similar to the F11 Pro. The renders show that it will be also featuring a pop-up selfie shooter and a dual camera setup like F11 Pro. 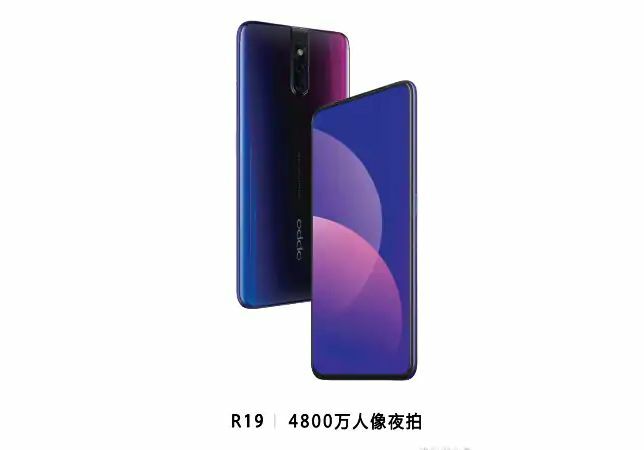 The Oppo R19 has a notch-less display with tall aspect ratio. The pop-up selfie camera hides inside the upper frame of the device when not in use. The elevating camera is placed on the center area of the top edge of the device. The R19 has a vertical dual camera setup on the upper half of the back panel. It includes a 48-megapixel primary sensor. The camera housing which extends to the top edge of the device also includes an LED flash. Unlike the F11 Pro, the R19 lacks a rear-mounted fingerprint scanner. This indicates that like the Oppo R17 predecessor, its successor will be equipped with an in-display fingerprint reader. There is no information on the other specifications of the smartphone. The Oppo R17 and R17 Pro were made official in the first quarter of 2018. Hence, the R19 series is likely to get announced in Q1 2019.